I tried a new brand (to me) of coloured pencils on this one. These pencils are woodless. 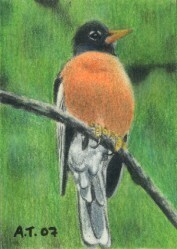 They blend and go down a bit different than the Prismacolor and I found that I could not get as much fine detail with them on such a small sized piece. I had to resort to the Prismacolor to work in the detail. These new pencils will take a little getting used to, but I can see some advantages to their blendability qualities. Also, they supposedly last longer than regular pencils with wood casings. The original ref photo is by Loredana and used with permission. Another stunning animal portrait. Great job, Ana! Splendid work, Ana! Perfectly rendered!